With extensive knowhow in this domain, we are indulged in providing a supreme quality gamut of Tensile Umbrella. Ooviam Facades is well-known organization effectively engaged in manufacturing high-performance Roofing System since its foundation in 2010. 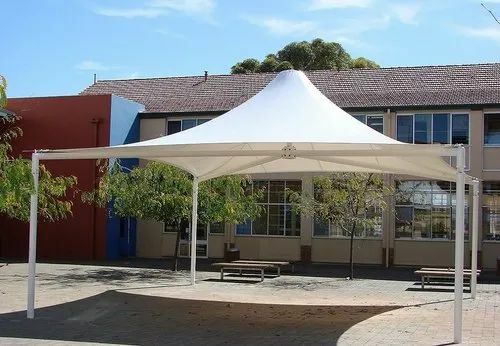 We are specialized in an extensive gamut of highly effective products such as Gazebo Tensile Structures, Auditorium Tensile Structures and GI Metal Roofing. We are involved in providing modular buildings to meet the space needs of major markets, which includes education, commercial, construction, development, government, health care, industrial, manufacturing, petrochemical, retail& Real estate fraternity etc. Our highly useful machines improve work efficiency greatly and reduce labor intension. The company is also increasingly providing high value added designing customized systems for its customers. With the range of superior, economical quality products, we have achieved huge client base and formidable position in this niche industry. We are also offering an excellent quality of Engineering Building Work. We have set up vast infrastructure which is facilitated with latest machines and divided into different sections for hassle free functioning starting from production to delivery. Our range of products can be customized to gratify all requirements of construction and housing demands from portable offices, labor sheds, bunk houses, factory sheds, security cabins, site offices to even residential units. With the vast expansion of the industrial sector, the need for dynamic production and quality promise remains a vital issue for our company, developing new and sturdy design innovations. .